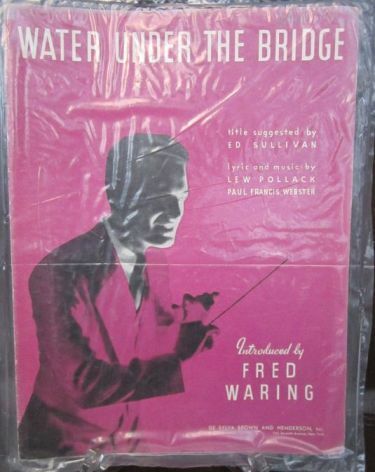 What's the origin/background of the phrase "water under the bridge"? To what does it allude? I understand it means to let bygones be bygones--to move on from the past. But I don't think I understand what water and the bridge represent. "Laisser passer l'eau sous les ponts"
" Il passera bien de l'eau sous les ponts"
The idiom, water under the bridge is akin to another expression What's done is done, which means it is too late and pointless to change the past, too much water has flowed; i.e. time stands still for no one. If you have ever tried to stop the flow of a river, (and who hasn't?) the comparison and meaning of water under the bridge becomes clearer. The person is saying they have moved forward with their life, the matter is now unimportant and not worthy of further consideration. As the river flows on, so does life. Since we often associate running water with rivers, and where there are rivers there are usually bridges, water under the bridge is similar to a fixed phrase, or chunk of language (you also have the expression bridge over water). One could argue that the bridge represents the permanent present, while the river represents life and time which marches inexorably forward. Based only on this snippet, (in vain I tried to find the lyrics online), it appears the meaning of the idiom was not familiar at the time. But it might explain its appearance in 1935. Hardly the stuff of poetry, but earlier instances I did not find. The earliest use I can find of it comes from 1920, from a compilation of the U.K. "Parliamentary Debates." Time after time the best intentions have fallen fruitless, the very highest statesmanship has been brought to bear upon the problem, but it has all passed like water under the bridge. 1913 Wireless World I. 34/1 Much water has flowed under London Bridge since those days. 1914 Kipling Let. 15 Sept. in Ld. Birkenhead Rudyard Kipling (1978) xviii. 279 Your articles..are a little too remote..but of course—much water, or shall we say much blood, has flowed under the bridges since they were written. However, from looking at Google books, this expression seems only seems to have become relatively common around 1930 in the U.S.A.
something that has happened and cannot be changed I should probably have asked for more money when I was offered the job, but hey, that's water under the bridge now. That's happened in the past, cannot be undone, and can no longer be a consideration. The proverb comes from the saying: 'A lot of water has flowed (passed, gone) over the dam (under the bridge.) 'Under the bridge' is British and is the oldest part of the proverb. 'Over the dam' is its American variant. I have located a form of its use in 1847, in a piece entitled "Manzoni" in the New Monthly Magazine and Humorist: Part the Third, 1847. On second inspection the piece was published at least 3 years earlier, in 1844 at the latest, prior to being reprieved in The New Monthly Magazine. Although the precise expression of "water under the bridge", I believe the usage refers to the eponymous Manzoni considering what was left behind, both physically and emotionally. Not the answer you're looking for? Browse other questions tagged meaning etymology idioms or ask your own question. What's the origin of “throwing someone under the bus”? “At the drop of a hat”?